Circle/Delete #1 combines a light and medium yellow. This concealer thats an eye treatment as well. In a base titanium dioxide and zinc oxide, Circle/Delete supplies the delicate eye area with conditioners like jojoba esters and avocado oil, both high in vitamins A, C, D and E, green tea extract to soothe and provide a potent antioxidant, and vitamin K. Vitamin K is necessary for blood clottingand may help withdark circles that are caused by leakage of tiny blood vessels. Vitamin K is thought to repair the blood vessels as well as acting like a skin bleaching agent to aid with hyperpigmentation. 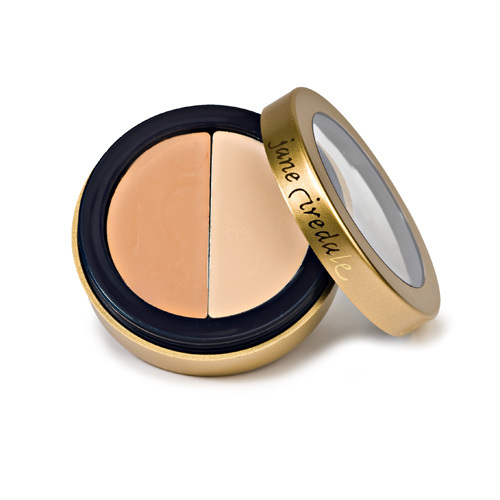 Circle/Delete conceals by providing two colors in each pot that can be mixed together for the exact shade.